Turns out you probably won't ever make up for those all-nighters you pulled in college. Researchers at Harvard-affiliate Brigham and Women's Hospital find that chronic sleep loss over several weeks causes reaction time to slow almost tenfold, increasing the risk of fatigue-related accidents. Scientists have long figured out that sleep loss impairs memory formation and negatively impacts performance, but previous research had not investigated how short-term sleep deprivation interacts with chronic sleep loss, according to Daniel A. Cohen, a neurology instructor at Harvard Medical School and the lead author of the paper. The findings, published in last Wednesday in the interdisciplinary journal, Science Translational Medicine, show the effects of as little as one night's sleep loss on performance the following day. To simulate staying up all night and sleeping extra hours the next day to catch up, the researchers put nine volunteers on a specialized sleep-wake schedule consisting of 33 hours of wakefulness and 10 hours of sleep. Using a series of tests, the researchers measured the subjects' reflexes, motor skills, memory, decision making, and other brain functions. The results have yielded conclusions that may overturn commonly held misconceptions about sleep, Cohen said. “One of the main take-home message is that… the amount or quality of the sleep for one night is not enough to determine whether someone is fully recovered from weeks of chronic sleep deprivation,” he said. The findings have direct implications for college students, who frequently stay up all night to study, said Medical School professor Charles A. Czeisler '74, who is one of the authors. Czeisler and his colleagues found that the body’s circadian rhythm—the natural 24-hour cycle—is actually able to partially override sleepiness during the day, which explains why some people mistakenly believe they have completely recovered lost sleep after only one or two nights of sleeping well. But students don’t pull all nighters “out of the blue,” Czeisler said. 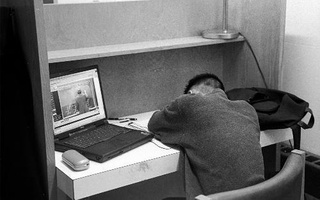 Students are likely sleep only four to five hours a night the week leading up to exams. They may also stay up all night to finish studying right before the exam, which only burdens the already-present sleep debt even more. Several weeks into the study, for example, the subjects’ average reaction time at night had slowed from a quarter of a second to almost four seconds. “That’s enough time to run off the road into a ditch,” Czeisler said, adding that the dangers of sleep deprivation touch people ranging from truck drivers to resident physicians. Teenagers—especially girls—who regularly sleep less than eight hours a night tend to eat more fatty and sugary foods than those who maintain adequate sleep schedules, according to a study published in yesterday’s issue of the journal Sleep. The Occupational Safety and Health Administration will consider a petition filed in part by two HMS professors to lower the nationwide limit on the number of hours that medical residents can work each week. People who start smoking marijuana at a young age are more likely to perform poorly at cognitive tasks than those who start at a later age, according to a new study by Harvard-affiliated researchers. A Rockefeller University scientist, speaking at a discussion hosted by the Mind/Brain/Behavior Initiative Tuesday, said that anxiety may have more negative health effects than commonly expected.